People are often surprised to hear that our pigs spend the winter outside. Manitoba winters certainly can get cold as temperatures frequently drop into the -30°Cs without the wind-chill on the December, January and February days. 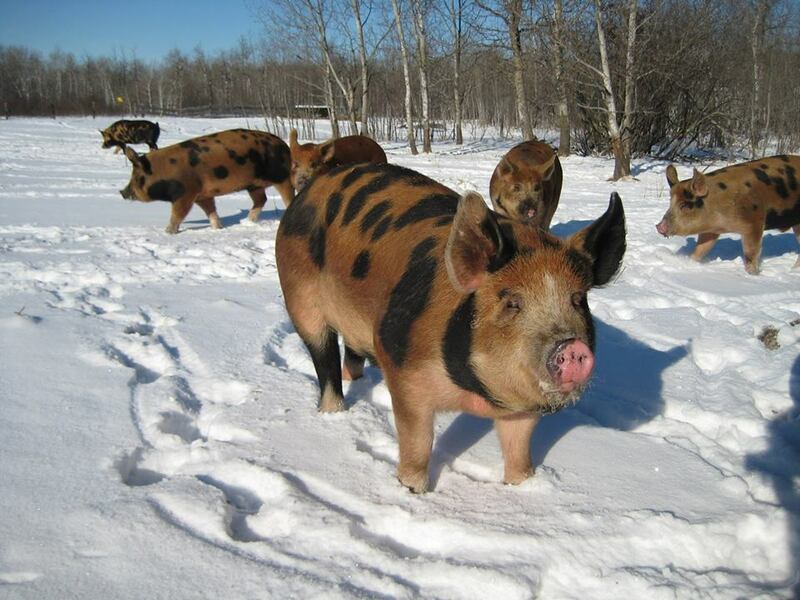 Our pigs are very winter hardy and they actually enjoy the winter. We have selected heritage breeds, mainly Tamworth (red) and Berkshire (black and white), that grow relatively thick/long fur and that do well outside. 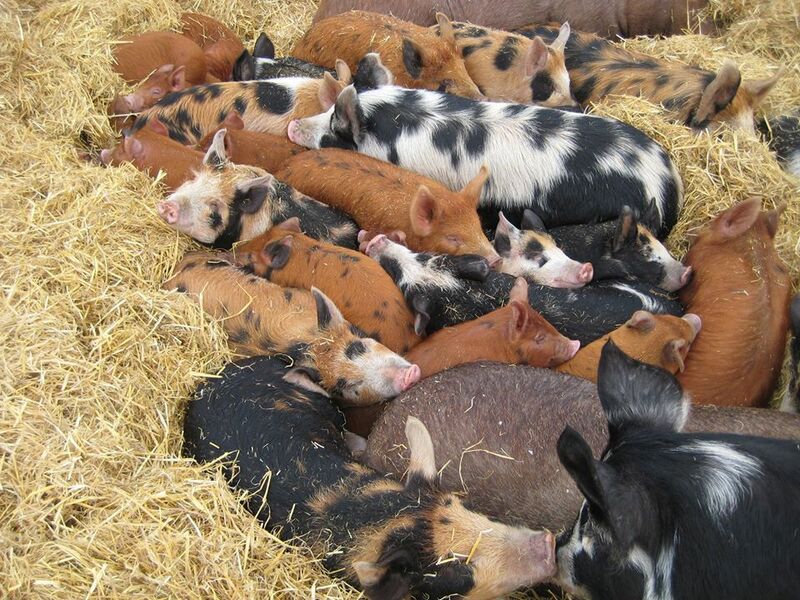 Our individual pigs come from farms where they were born and raised outside. So, they are used to Manitoba’s variable weather conditions. And, we have selected individuals with thicker fur coats as our breeding animals too. 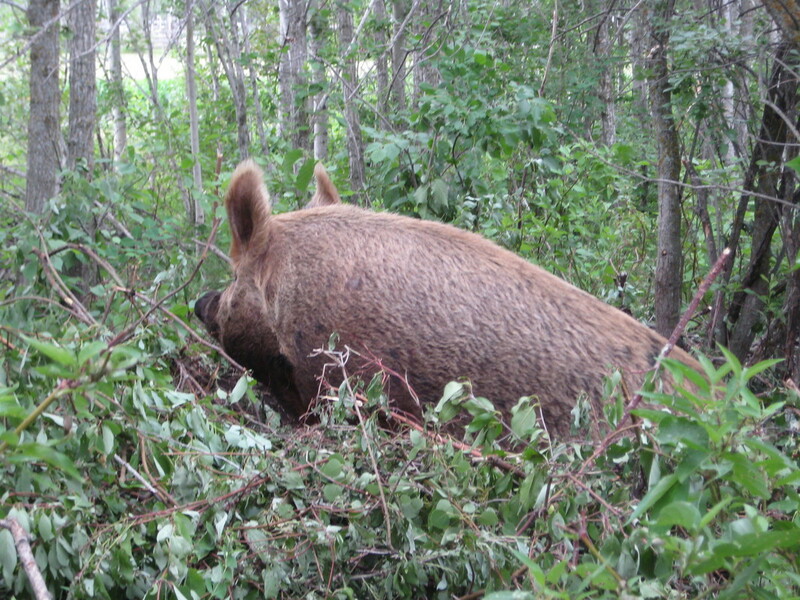 Our pigs live in an ~20 acre wooded area. The dense trees provide them with protection from the wind and we give our pigs lots of straw in the winter. We provide them with large, round straw bales as needed. Our aim being to ensure they can pile up the straw, tunnel into it and be completely covered by it when they choose to sleep in it. It is pretty amazing on a chilly morning to go out to the straw piles and not see any pigs until the pigs realize you are there and they jump out of the straw with the excitement of seeing you! They are always happy to see us as we pail feed them food every day and we often have treats, like kitchen scraps and hard-boiled eggs, for them as well. 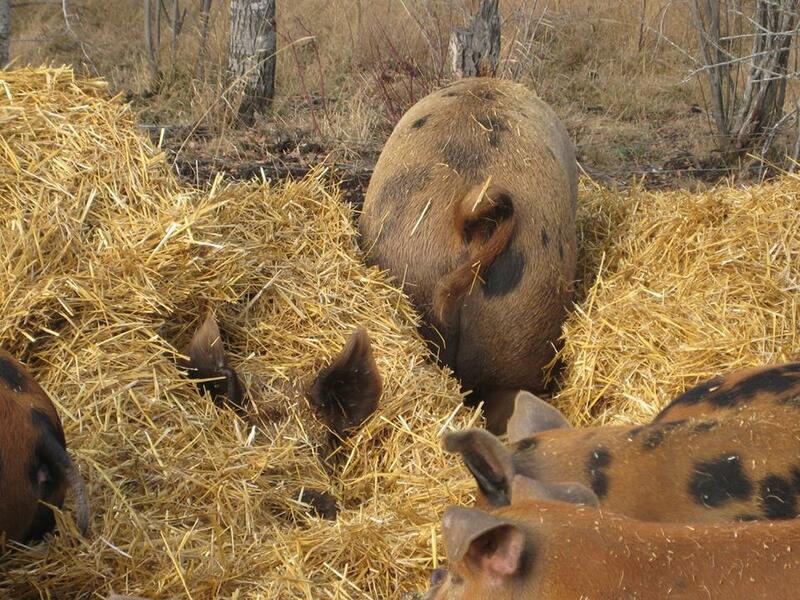 On the cold days, when the pigs come bursting out of the straw piles, where they are typically cuddled up together sleeping, large bursts of steam also resonate from their straw beds! 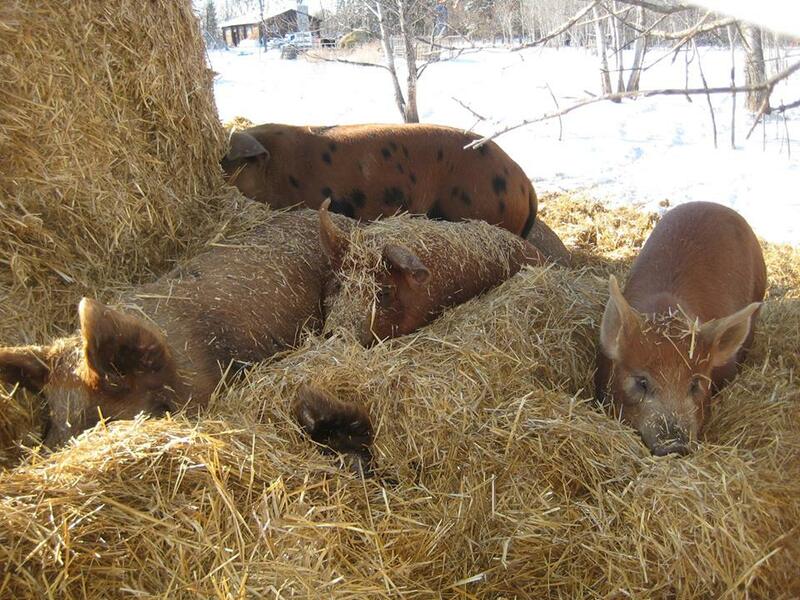 On the sunny days, it is common to see the pigs laying on top of the straw sleeping and soaking up the sun. Much like a house cat in a sunbeam! Whether it is cold or sunny, the piglets love playing in the loose straw and will pick up mouthfuls of straw and twirl around in delight! The lives our pigs’ lead being outside year round is so good for their minds and bodies. They get so much mental and physical stimulation by interacting with one another, being able to explore the forest and forage for food, experiencing the different seasons and playing in the big bales of straw we provide them. Just like us, pigs benefit from being out in nature! 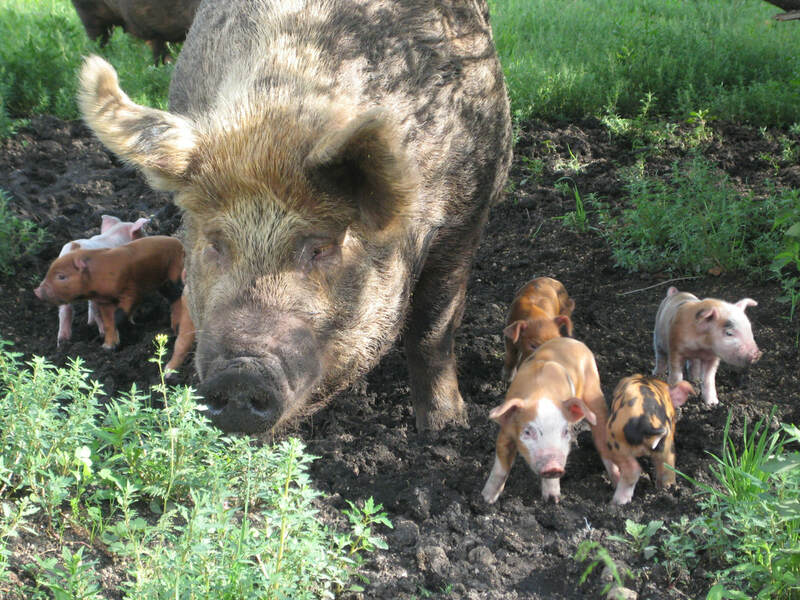 Eating pork from pigs raised outdoors, on pasture or in a woodlot, has numerous benefits to your own health, in addition to being better for the environment and the welfare of the pigs. Did you know that the dominant fat in pork is monounsaturated fat, which is the same fat present in olive oil? Monounsaturated fats are considered good for your heart as they protect against cardiovascular disease by improving membrane fluidity. So, pork fat is considered good for your heart's health! One of the most important health benefits of pork raised outdoors for us “northerners” is that this pork, particularly the fat, is rich in vitamin D. Pigs raised outdoors make vitamin D in their skin and fat through exposure to natural sunlight. People also synthesize vitamin D in their skin when they are exposed to sunlight. However, in the winter, in northern climates, many people do not make enough vitamin D and thus need to increase their intake of it. Some people choose to do this by way of a daily supplement, but eating food items rich in vitamin D, such as pork from pigs raised outside or fatty fish or beef liver, can also help us improve our vitamin D levels. Low vitamin D levels can are known to cause numerous health problems in people including poor immunity, delayed wound healing, hair loss, bone and muscle pain, depression, etc. So, it is really important to ensure you are not vitamin D deficient. The meat and fat of these pigs, when raised outside on natural forage with exposure to natural sunlight, is also rich in other micronutrients such as vitamin E and minerals, such as selenium. These pigs also tend to be raised without the use of feed additives or antibiotics, which can also benefit our health as well as the pigs. 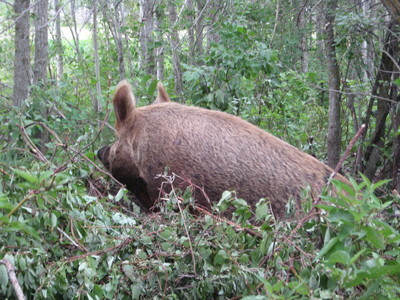 Choosing pasture or woodlot reared pork is good for human, pig and environmental health! Fall is such a beautiful time of year in Manitoba. The leaves are all changing colour. The weather is cooler. The smell of a roasting chicken in your house is a lovely way to enjoy a Sunday afternoon. This recipe of Jamie Oliver's has become my favourite roast chicken recipe. 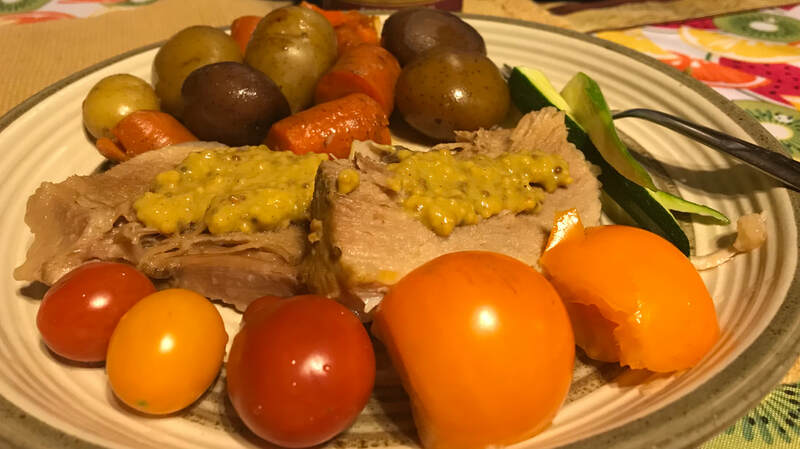 The combination of the lemon and the herbs with the roast veggies is perfect. I highly recommend trying it. Chop up the veggies (don't peel them). Break the garlic bulb into cloves (without peeling). Put the veggies, garlic and herbs in a pile in the centre of your roasting pan and drizzle oil over them. Rub olive oil, salt and pepper over the entire chicken and put it on top of the veggie pile. Prick the lemon in multiple spots with a knife (be careful) and then stick the whole lemon inside the chicken along with the bunch of fresh poultry herbs. Place the covered roaster in the oven and cook for ~20 minutes per lb (to ensure it is completely cooked make sure the meat has reached 165°F using a meat thermometer). Cut up your potatoes and any other roast veggies you would like to add and place them in the roaster for the last ~45 minutes of cooking time. Enjoy!! The potatoes infused with lemon are so delicious! If you have any left overs, make sure you pull the meat off the bones once the chicken has cooled and refrigerate them to eat later. We love that our sows are able to give birth (farrow) naturally in the forest. The sows quite classically isolate themselves from the rest of the pig herd ~24 hours before giving birth. They pick a favourite spot in the forest and they build themselves a nest. This typically involves them cleaning out a circular area with a diameter slightly longer than the length of the sow. They collect branches from the cleared area and from the surrounding area and build up an outer edge on their nest with these branches. 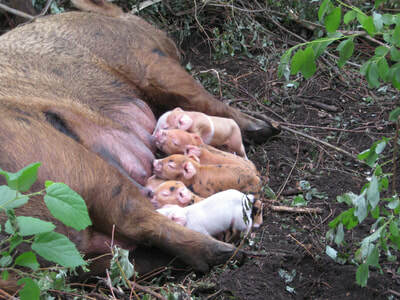 The sows typically stay at the nest with the young for about 7 days before they join the herd with the little ones. Given that these animals are under our care, we always go out into the forest and try to find them. 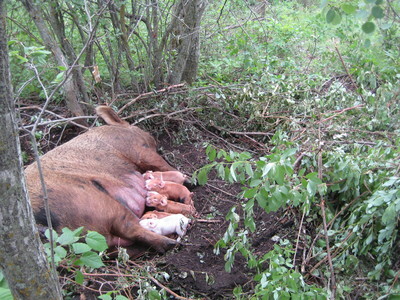 The sows can be quite protective of their nest and young, so we don't typically visit for long. We do a quick check of mom and babies. We provide a bowl of water. And then we leave them alone. It is a pretty amazing experience to see and hear the sow in her carefully built nest with her young. Here are a few pictures. It is really hard to capture these moments without being there for the 360 degree view and to hear and see the sow and piglets talking to one another....it gives me goose bumps, especially when I think about the setting in which most domestic pigs give birth and spend their first week post delivery. ​When I moved out to the farm and started raising chickens again, I have to admit that the first time I wanted to roast a chicken, I really didn’t know how. So, I called my mom! What temperature? How long? Thawed? Frozen? If I want veggies, when do I add them? Etc. Needless to say, I am much more comfortable roasting a chicken now! There are a lot of different ways to roast a chicken and I have heard all kinds of great recipe ideas from friends and family. Butter under the skin. Delicious apple or cranberry based stuffings. Whole lemon or can of beer placed inside the chicken. The list is endless! But, I must admit I usually roast 2 or so chickens a month and I like to keep it very simple. 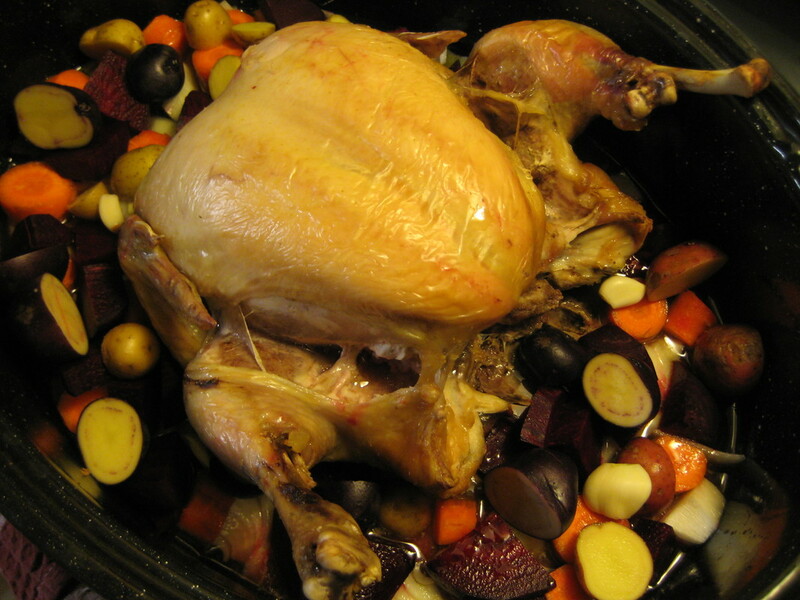 I am usually only feeding one person but I love roasting a chicken on the weekend and enjoying it with roasted veggies and then using it in various dishes throughout the week. In curry, on a salad or in a sandwich being my favorites. I am always busy and often forget to take the chicken out of the freezer in advance. And I just don’t really have time to dedicate to making a fancy roast chicken for myself, so follow the simplest roast chicken recipe ever! These pasture reared chickens have so much flavor and juice in them, that I actually prefer going super simple when cooking them. This also adds to my comfort level throwing the left overs is so many different dishes throughout the week and sharing pieces of the chickens with my dogs (who always deserve a treat and they LOVE pasture reared chicken). Once the meat temperature is at 160 F – it is finished! Often, has a nice yellow brown crisp skin on it at this stage and the legs easily pull off with clear juices present. I usually add some veggies ~45 minutes before I think the chicken will be finished – my favourites are carrots, potatoes, onions and beets. My chickens typically take about 2.5 hours to cook in my oven (depends a bit on the size), so I try to remember to add the veggies around the 2 hour point. And voila, that is my super simple roast chicken recipe that provides me with moist, flavorful chicken to make multiple meals throughout the week in addition to providing some much thwarted treats for my old girls (of the canine variety). Hope you try this and realize just how easy it is to roast a chicken, from frozen, no matter how busy you happen to be! I loved hearing this story from a friend, mom and local, sustainable food supporter! For Easter fun, this mom made coloured Easter eggs with her young daughters the Sunday before Easter weekend. 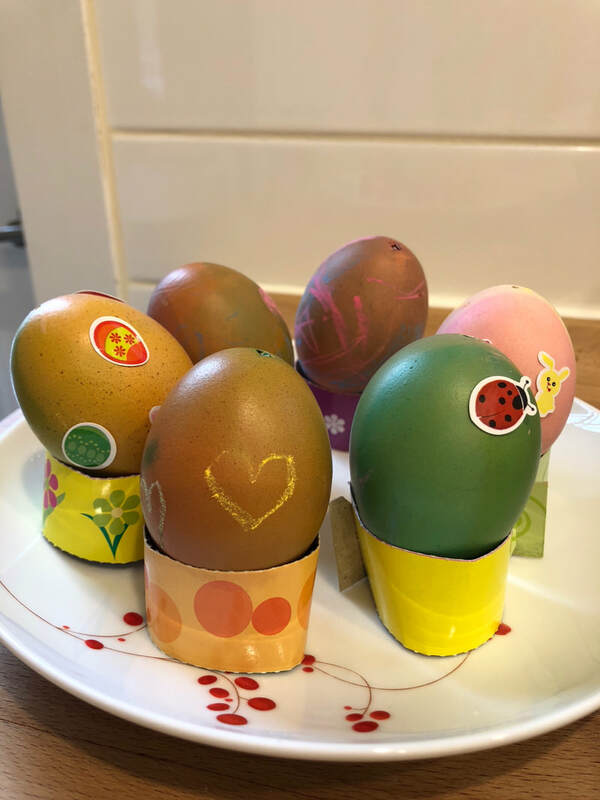 They coloured and decorated their eggs using an egg decorating package they purchased from a local store. The girls are both quite young and have short attention spans, but they really enjoyed colouring the eggs and having their mom's full attention! 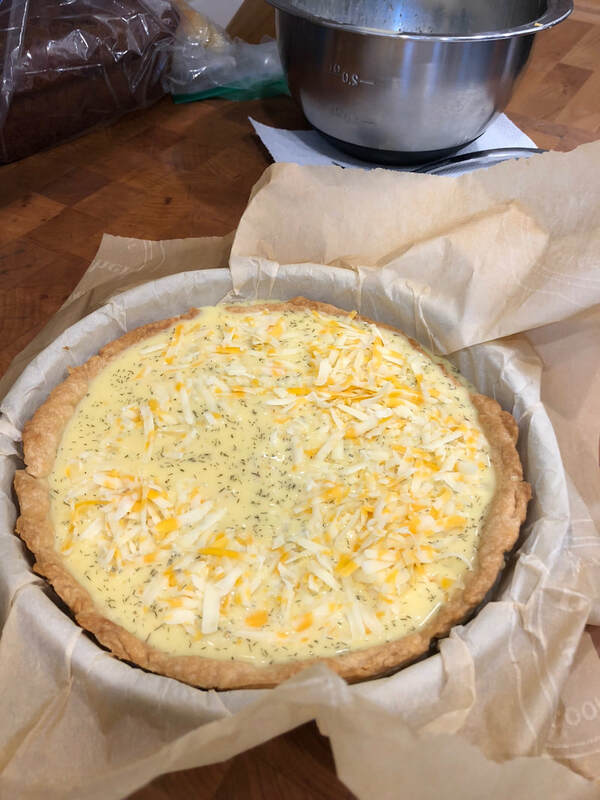 Afterwards, they make quiche with the eggs! Such a fun way to enjoy some Sunday family time together and a great way to use the eggs for a delicious meal afterwards. One of the major joys I get from having the farm and selling food to family and friends, is hearing these lovely stories of how the food items are used and enjoyed by family and friends. The best stories are those involving family time! Whether it be roasting that big pastured reared chicken to enjoy when family is over on the weekend or cooking that delicious woodlot reared ham for family at Easter or for New Year's, your stories warm my heart and keep me wanting to keep growing food to share with all of you - my extended farm family! Hope everyone is having a lovely, Easter long weekend!